The Kansas Not-For-Profit Corporation Articles of Incorporation | Form CN 51-02 must be submitted to the Kansas Secretary of State for approval whenever an entity wishes to operate as a nonprofit corporation in Kansas. This form should be submitted with the proper documentation and any and all provisions along with payment for the full amount of the $20.00 filing fee. This is just one step in forming nonprofit corporation in Kansas but it is also a legally required one. This does not guarantee that a corporation is Tax Exempt. Only the Internal Revenue Service may authorize tax exempt status and will require specific wording in the Articles of Incorporation to apply. It is strongly recommended to consult with the I.R.S. and/or appropriate professionals (such as an attorney) if one is unsure of the process required to solidify a nonprofit corporation and operate it in compliance with Kansas State Law. You may file these articles online or by mail. 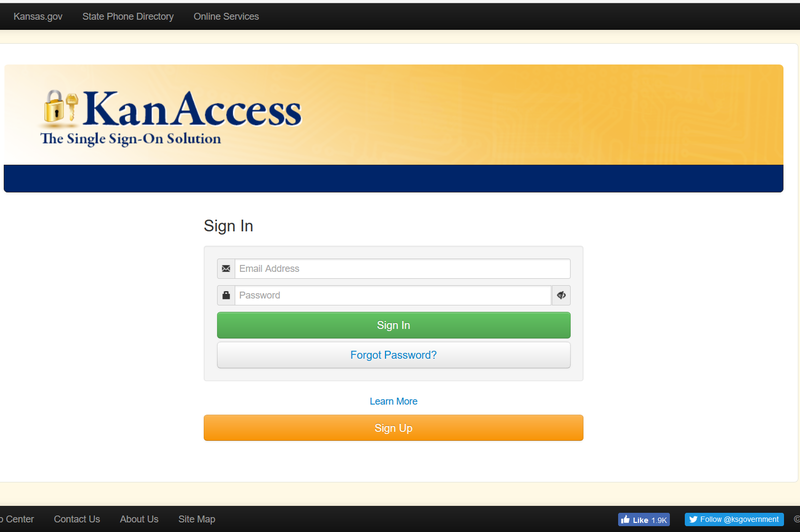 If you choose to file online, you must obtain a KanAccess account by going here: https://www.kansas.gov/user/login. 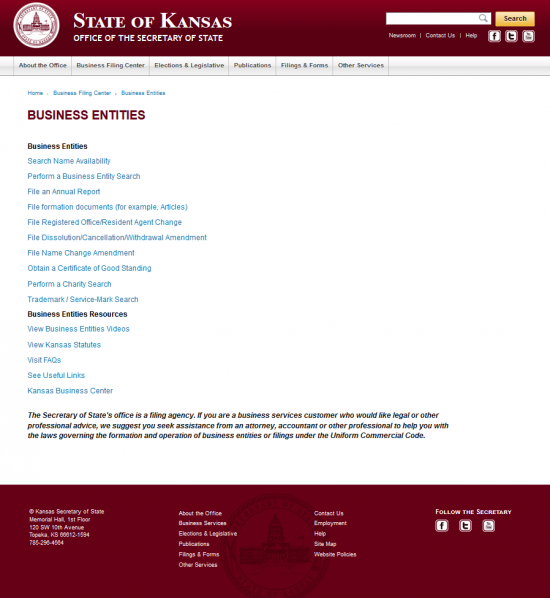 You may also file by mail by sending all documentation, the Kansas Not-For-Profit Corporation Articles of Incorporation, and a check or money order made payable to “Secretary of State” for the full filing fee amount of $20.00 to Kansas Office of the Secretary of State, Memorial Hall 1st Floor, 120 S.W. 10th Avenue, Topeka, KS 66612-1594. 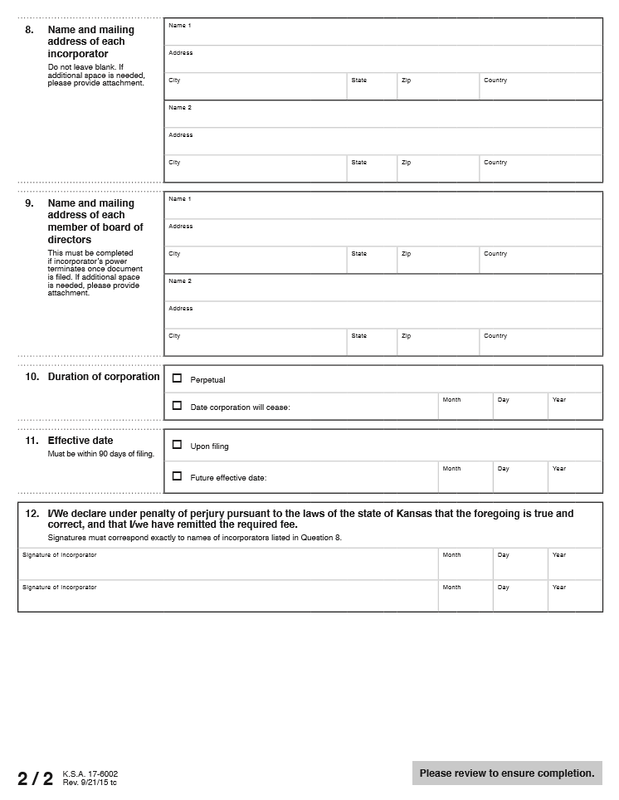 Regardless of how you file, all the information on this form must be present and reported to the Kansas Secretary of State. 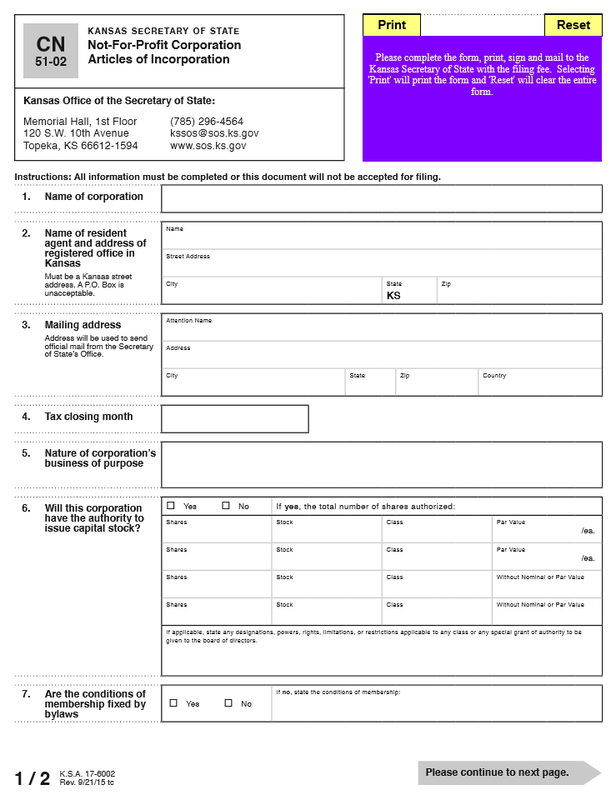 Step 1 - You may download the Kansas Not-For-Profit Corporation here: Form CN 51-02 or using the “Download” button. This will consist of two pages. The first will contain some useful descriptions while the second page consists of the actual articles. You may use a PDF program to fill this out onscreen then print it or you may print it then type in the information. Step 2 - You must write in the Full Name of the corporation that is being formed by these articles in section 1. Step 3 - In section 2, enter the Name and Street Address of the Registered Agent who shall receive service of process documents on behalf of the forming nonprofit. Do this by entering either the Full Name of an individual or that of a business entity in the first row. This must be either an adult or a business other then the corporation being formed. Then report the physical Street Address of the Registered Agent in the next two rows using the appropriately labeled boxes (Address, City, and Zip Code). This must be a physical location in Kansas and may not be a P.O. Box. Step 4 - In the third section, enter the not-for-profit corporation’s Mailing Address. This must be a reliable point of contact able to receive official communications and documents mailed by the Kansas Secretary of State to this entity. On the first row, enter the Contact party’s Full Name. Then on the second row, enter the Building Number, Street, and Suite Number of the Mailing Address used by this corporation. On the third row, enter the City, State, Zip Code, and Country of the Mailing Address for this corporation. Step 5 - In the fourth section, report the not-for-profit corporation’s Tax Closing Month. Step 6 – In the fifth section, document the full purpose of the not-for-profit corporation. Make sure you write out a specific purpose for forming this corporation and defining how it will operate as a nonprofit in the State of Kansas. Step 7 - In the sixth section, you must report whether this nonprofit corporation will have the Authority to Issue Capital Stock. If not then mark the box labeled “No” and proceed to section seven. If it may issue capital stock then mark the box labeled “Yes” and fill in the table. You must report each the number of shares and stock for each class, then the par value for each share in that row’s class. There will be two rows for stocks with no Nominal Par value. If there are classes with special restrictions or privileges you must report this in the box below the table. Step 9 - In the eighth section, list the Full Name and Address of each Incorporator forming this corporation. There is enough space to enter the Name, Street Address, City, State, Zip Code, and Country for two Incorporators. If there are more this list may be continued on a separate sheet of paper then attached. Step 10 - In the ninth section, list the Full Name and Address of each Member on the Board of Directors. This section may not be left blank if the Incorporator’s power terminates upon filing these articles. Step 11 - In the tenth section, check the first box (labeled “Perpetual”) if this corporation shall continue to operate without an end date. If there is a specified date when this corporation shall stop operating and cease to be, place a check mark in the box labeled “Date corporation will cease,” then enter the Month, Day, and Year of this entity’s Termination Date. Step 12 - In the eleventh section, report the official Effective Date this corporation shall begin its life as per these articles. If it is to operate as soon as the articles are accepted, then place a check mark in the box labeled “Upon filing.” If there is a Specific Date then mark the box labeled “Future effective date” then enter the Month, Day, and Year this nonprofit corporation shall start operating as such in the boxes provided. Step 13 - In the twelfth section, each Incorporator listed in the eighth section must provide his/her Signature then Date that Signature by entering the Month, Day, and Year the have signed this document. Step 2 - Locate the link labeled “File Formation Documents (for example Articles),” under the “Business Entities” sub-heading, and select it. This will direct you to KanAccess. You must have a login for this. 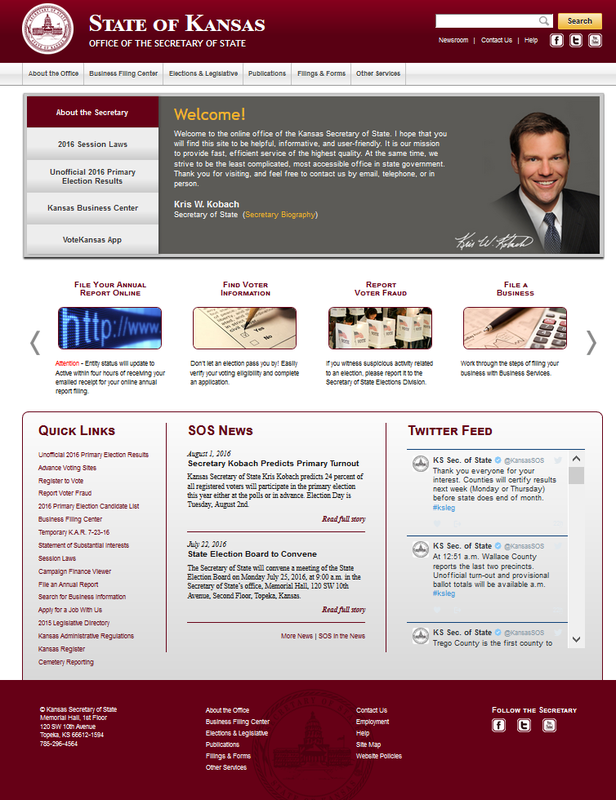 Step 4 - The greetings page will have several sections. In the bottom left hand section select the link “Business Entity Formation (AOI)” . Step 6 - If you would like to make individual payments as you file then select the radio button beginning with the words “Pay as you go” however if you have existing account that you would like billed then select the second radio button. For our purposes, select the first radio button then click on the “Continue” button. Step 7 - Select the radio button labeled “Kansas not for profit $20.00″ then select the “Continue” button. Step 8 - You will have three options for entering the Name of your nonprofit corporation. If you have reserved it online then enter the name of your corporation under the heading “Name reserved online?” If you have reserved it by paper then enter the I.D. Number you were assigned in the first text field under the heading “Name reserved on paper?” then enter your name in the second text field. We shall assume no previous name reservation for these instructions. Enter the Name you wish your nonprofit corporation to be known in the text field under the heading “Name not reserved?” and click the “Continue” button in this section. 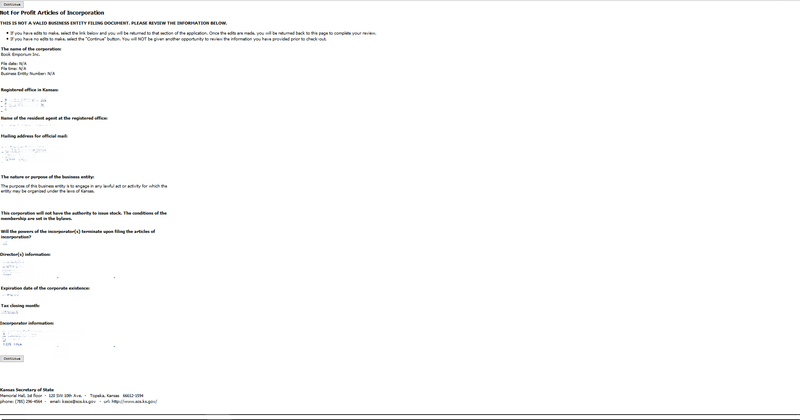 Step 9 - You will be directed to a Name Status page which will tell you whether the Name is available or not. Keep entering a Name until you find an available one you wish to use. When you have found one then select the “Continue” button on this page. Step 13 - The next page will ask you to confirm which Resident Agent is the correct one by selecting the appropriate radio button. Select the Resident Agent you have obtained the click on the “Continue” button. Step 14 - Next enter the Street Number (building number), Street Direction, Street Name, Street Suffix, City, Zip Code, and Country of the Resident Agent’s Address. This must be the physical location of the Resident Agent. When you have done this select the “Continue” button. Step 15 - Next you will be asked to define if the Resident Agent has a separate Mailing Address. If so, select the second radio button then enter this information on the next screen. If not then select the first radio button then click “Continue.” For our purposes, select the first radio button then select the “Continue” button. 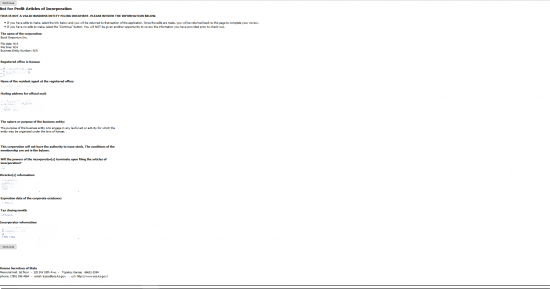 Step 16 - In the next screen, you must report the Purpose of the nonprofit corporation. There will be a default purpose, however if you plan on applying for Tax-Exempt Status, you may enter 501(c)(3) compliant language in the large text field provided. Below this will be a multiple choice concerning this entity’s intended lifespan. If this nonprofit will operate without a predetermined Dissolution Date, then select the first radio button under the question “Is this entity Perpetual?” If there is an intended Date of Dissolution, select the radio button labeled “No” then enter this Date in the field provided. 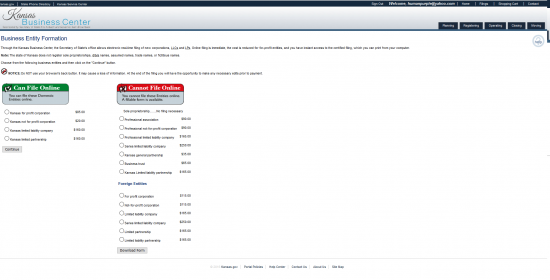 Next, using the drop down menu at the end of this section, select the Tax Closing Month for this entity. Once done, click on the “Continue” button. 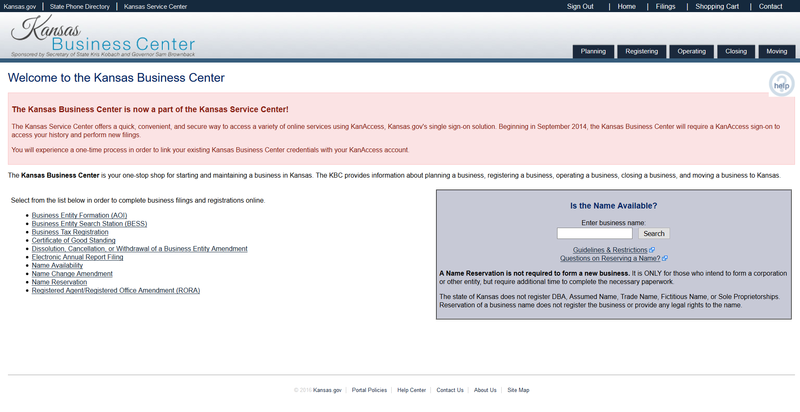 Step 17 - On the next page, indicate if the Incorporator is an Individual or a Business using the drop down list. 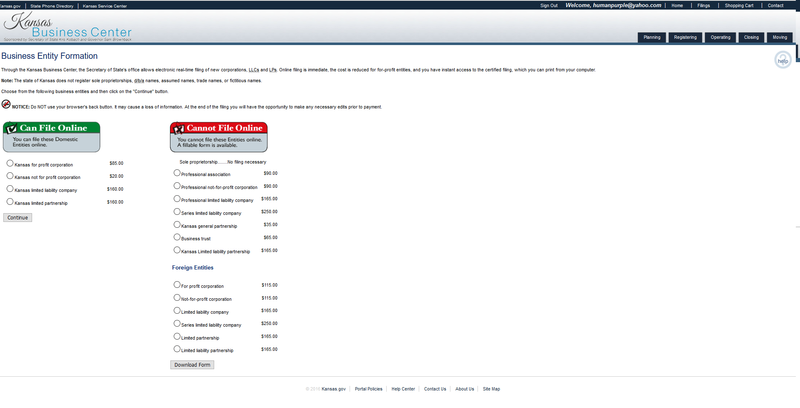 For our purposes, select “A Business” then select the “Continue” button. Step 21 - Next, you will be able to view the Directors you have added in a table. Each row will contain an “Edit” button and a “Delete” button so you may alter or delete the record on that row. Below the table, you have the option to add more Directors with the “Add Additional” button. Once done, click on the “Continue” button. Step 22 - Read the paragraph in this section as it will contain valuable information in navigation (do not use your back button). You have the opportunity to review the information you have entered on the next page. Select the button “Show Preview” where each piece of information shall act as a link to the section you entered that information in. This will be the only way you have for navigating to this section. Verify all the information is correct on this page. Once it is, select the “Continue” button either at the top of the page or the bottom of the page. This will direct you to the payment area where you may enter your ACH or Credit Card information. You must pay the Filing Fee of $20.00 for these articles to be reviewed by the Kansas Secretary of State. Step 23 - Each piece of information shall act as a link to the section you entered that information in. This is the only way you have of navigating to this section. Verify all the information is correct on this page. Once it is, select the “Continue” button either at the top of the page or the bottom of the page. This will direct you to the payment area where you may enter your ACH or Credit Card information. You must pay the Filing Fee of $20.00 for these articles to be reviewed by the Kansas Secretary of State.